Nevada Barr, a National Park Service ranger who once worked along the Natchez Trace Parkway in Mississippi, is most known for her series of mystery novelseach of which is set in a national parkabout Anna Pigeon, a wine drinking, tough talking, law enforcement ranger who ran away from Manhattan to join the National Park Service (Rancourt). Though she was born in Nevada (on March 1, 1952), she actually received her name from a favorite character in one of her fathers books. She is the daughter of two pilots and grew up in Susanville, California, near a small mountain airport eighty miles northwest of Reno. She attended college at Cal Poly, San Luis Obispo and graduate school at the University of California at Irvine. For several years, she pursued a career in theater. In New York she served as a member of the Classic Stage Company and performed in several off-Broadway plays. After five years in the Big Apple, she moved to Minneapolis, where she did more theater work and appeared in several television advertisements and industrial films. Her former husband was involved with the National Park Service, and it was this that first raised Barrs interest in conservation and wildlife. Before she began writing full-time, she worked intermittently as a National Park Service ranger. Her stints in various parks have served as source material for the settings of each of her novels. She began seriously writing in 1978, and in 1984, she finished her first book, Bittersweet, a piece of historical fiction about a shared love between two women. After this, she turned to writing mysteries. 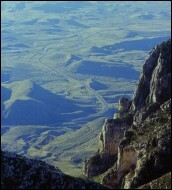 Her stint at Guadalupe Mountains National Park in Texas served as the source for the setting of Track of the Cat (1993), her critically acclaimed mystery debut. The book won the 1994 Agatha Award for Best First Novel of 1993 and the 1994 Anthony Award for Best Novel of 1993. The plot of Track of the Cat revolves around the discovery of a rangers body that has seemingly been pawed to death by a lion, but who, as Anna Pigeon soon discovers, has fallen prey to foul play. A Superior Death (1994) is set in Isle Royale National Parkan island in the middle of Lake Superior. In this novel, a diver finds more than bargained for in a sunken ship (Rancourt). In Ill Wind (1995), Anna Pigeon is re-assigned to Colorados Mesa Verde National Park, the home of the vanished Anasazi civilization. Here, Pigeon finds a series of more than coincidental accidents including the death of a child and the murder of a friend (Lau-McDonald). Firestorm (1996) takes place amid the backdrop of a raging, and suspicious, forest fire in Californias Lassen Volcanic National Park. The majority of the book centers around a murder victim who is discovered after the fire. In Endangered Species (1997), Anna must solve the mysterious crash of a drug interdiction plane at Cumberland Island National Seashore, an isolated island off the coast of Georgia, and in Blind Descent (1998), she must solve a crime in newly discovered Lechugilla Cave near Carlsbad Caverns, New Mexico. There are several parallels between Nevada Barr and her character Anna Pigeon. Both are (or have been) law enforcement rangers in their forties. Both have a sister named Molly. Both fled the big city in favor of the National Park Service. Reviewers have praised Barr for her spectacular descriptions, psychological insight, and a refreshingly independent heroine (Library Journal). The New York Times Book Review further claims that Barrs beautiful style is best displayed in natural settings. Barrs work, indeed, usually contains a strong regard for the landscape and some equally strong opinions about the National Park Service. Her outspoken comments about the park service in her bookswhich Barr claims are merely for entertainmenthave raised the ire of several National Park Service staffers for their disregard for the agency and its employees (Rancourt). After serving on the Natchez Trace Parkway in Mississippi, Barr retired from the National Park Service in order to write full time. Two of her books—Deep South (2000) and Hunting Season (2002)—are set on the Natchez Trace Parkway; the only other national park unit represented in more than one Anna Pigeon mystery is Isle Royale National Park, in A Superior Death (1994) and Winter Study (2008). She has published a total of 17 books in the Anna Pigeon series so far, with her most recent books set in Rocky Mountains National Park (Hard Truth, published in 2005), Big Bend National Park (Borderline, 2009), New Orleans (Burn, 2010) and Glen Canyon National Recreation Area (The Rope, 2012). She also published a stand-alone thriller, 13½, in 2009. A section of the original Natchez Trace near Port Gibson, Mississippi. The trace is a historic travel route between Natchez, Mississippi, and Nashville, Tennessee. Bittersweet. New York: St. Martins, 1984. Track of the Cat. New York: Putnam, 1993. A Superior Death. New York: Putnam, 1994. Ill Wind. New York: Putnam, 1995. Firestorm. New York: Putnam, 1996. Endangered Species. New York: Putnam, 1997. Blind Descent. New York: Putnam, 1998. Liberty Falling. New York: Putnam, 1999. Deep South. New York: Putnam, 2000. Blood Lure. New York: Putnam, 2001. Hunting Season. New York: Putnam, 2002. Flashback. New York: Putnam, 2003. High Country. New York: Putnam, 2004. Hard Truth. New York: Putnam, 2005. Winter Study. New York: Putnam, 2008. Borderline. New York: Putnam, 2009. 13½. New York: Vanguard Press, 2009. Burn. New York: Minotaur Books, 2010. The Rope. New York: Minotaur Books, 2012. (as editor) Nevada Barr Presents Malice Domestic 10: An Anthology of Original Traditional Mystery Stories. New York: Avon, 2001. (contributor) Deadly Housewives. Edited by Christine Matthews. New York: HarperCollins, 2006. Hat to Hat: A Skeptics Guide to Religion. New York: Putnam, 2003. Galvin, John. Dead Men Dont Wear Drab. Outside Magazine (April 1996). Klett, Rex E. Review of Track of the Cat. Library Journal 118.4 (1 March 1993): 112. Rancourt, Linda. Murder, She Writes. National Parks Magazine 69 (September/October 1995): 30-35. Shindler, Dorman T. The Law of Nature: An Interview with Nevada Barr. Armchair Detective: A Quarterly Journal Devoted to the Appreciation of Mystery, Detective, and Suspense Fiction 28.3 (Summer 1995): 308-11. Spenser, Pam. Review of Firestorm. School Library Journal 42.9 (September 1996): 239. ---. Review of Ill Wind. School Library Journal 41.7 (July 1995): 104. ---. Review of A Superior Death. School Library Journal 40.8 (August 1994): 183. ---. Review of Track of the Cat. School Library Journal 39.11 (November 1993): 148. Stasio, Marilyn. Review of Blind Descent. New York Times Book Review (5 April 1998). ---. Review of Blood Lure. New York Times Book Review (4 February 2001). ---. Review of Deep South. New York Times Book Review (19 March 2000). ---. Review of Endangered Species. New York Times Book Review (13 April 1997). ---. Review of Firestorm. New York Times Book Review (24 March 1996): 24. ---. Review of Ill Wind. New York Times Book Review (2 April 1995). ---. Review of Liberty Falling. New York Times Book Review (4 April 1999). ---. Review of A Superior Death. New York Times Book Review (17 April 1994): 19. ---. Review of Track of the Cat. New York Times Book Review (18 April 1993): 24. Nevada Barr Home Page. Official web site for Nevada Barr. Includes information about her books, biography, parks and rangers, and more. Nevada Barr page on Facebook. Nevada Barr page on Twitter. This page has been accessed 7914 times. About this page counter.